We don’t normally do book reviews, but you can make an exception when its title is the same as your blog. 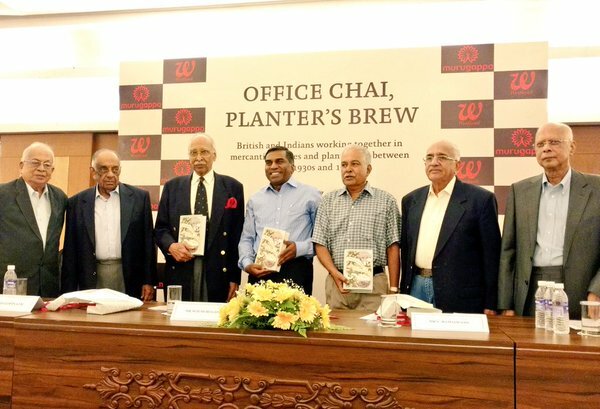 A new book, titled Office Chai, Planter’s Brew has hit the shelves this May. The book is authored by 85-year old senior journalist and prolific writer of non-fiction, S Muthiah and Chennai-based freelance writer Ranjitha Ashok. It is a collection of fifty fascinating real-life stories of Indians and Britishers working together between the 1930s and 1970s all over India. It provides a wonderful peep into the lives and times of Britishers and Indians who once worked closely together in the decades just before and after independence. The title of the book is related to a common memory relating to serving of tea in offices of many of those who contributed to the stories. While British officers were served tea from a steaming pot, encased in a cosy, complete with a sugar caddy, milk jug and biscuits, Indian officers were served in a cup with biscuits on the saucer. As for the planters, in their far-flung gardens, many a problem was settled by a drink in the manager’s house or at the club. Another narrator shares the tale of his granduncle who had a carefully preserved top hat in his bedroom cabinet although he always wore pristine dhotis and kurtas. But when asked about it, he would tell how while working as an employee of the British Petroleum in the 1930s, he was working outdoors on a summer day, when his immediate superior, one Mr Jones, took off his own hat and gave it to him. Like many of his generation, the granduncle rued the passing of the paternalistic British corporate culture. It is also revealed in another piece that Britishers couldn’t travel on buses, because it would pull down their status. Further, they couldn’t get married during the first few years on the job. Another narrator recounts going all suited up for his job interview, only to find his interviewer at a swimming pool wearing shorts, with a bottle of beer sitting right next to him. The author says that in those days, there was no obsession with college degrees. If a person had certain skills, they were likely to make it. If they came from a good family, had good manners, good communication skills and played a team sport, they had a good chance of being hired. Involvement in sports like cricket meant you were a team player, and this brought together everyone in the company on a level playing field. Be it an assistant manager or a covenanted assistant, once you reached a certain level, a club membership was a given, initially only to Britishers but later on the privileges were extended to Indians as well. Although the 500-plus page book is largely nostalgia, it also offers lessons in sound values and sterling character to today’s managers. The author says that the Britishers were generally fair at the work place and if you worked hard, you could do well for yourself. Caste or creed did not play a role… and you didn’t have to worry much about things like bribes and corruption. Irrespective of what post you held, you had to get your hands dirty on the shop floor. For instance, even if you had a BSc degree, you had to have knowledge of sugar-crushing machine and you had to know how to clean it too! The book is published by Westland and is priced at Rs 599.